I even planned to wait to buy a better mixer (one from my dreams), but then I realized that I need a good anti-stress, and macarons seemed ideall. Stress that fights stress :) I did my homework, read a couple of tips, and looked at a few videos – I managed from the first try! When I saw that the famous ‘foot’ had formed I started dancing around the apartment … I did three batches, and all three were good – not so difficult, there macarons ;) Do not be frightened by the long description, I went really detailed. 1. See the attached video, it’s very useful – I have exactly followed this procedure and it turned out great! 2. It says that egg whites should be separated from the yolks least 2 days before, and before you start to make macaroni you should remove the whites form the fridge at least 2 hours in advance. I have removed them the night before. The last tour I did with new whites from the fridge – but I put the in the microwave for 10 seconds. I read that it is an ok method – and it worked. 3. It is essential that the almonds are finely ground and the almonds and sugar should be sieved twice before adding to the merangue. 4. It is better to use a powdered color than the current one. 5. 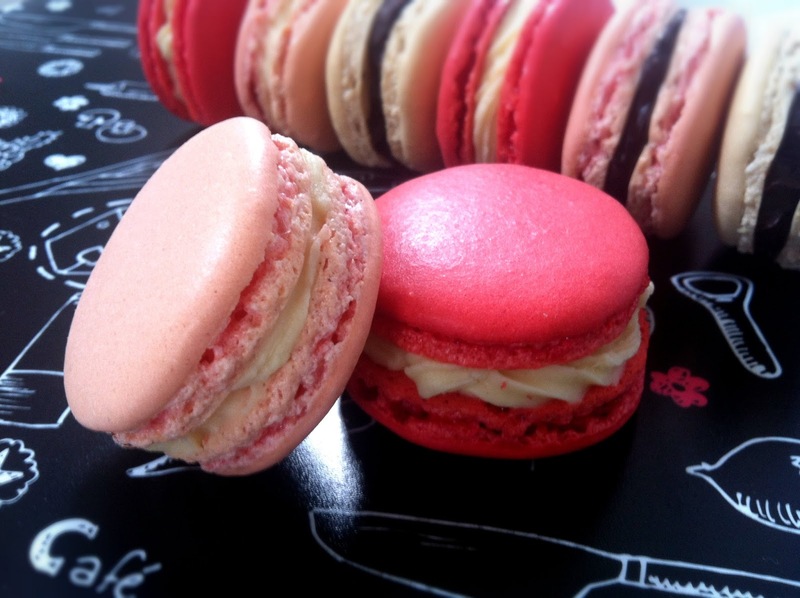 You shouldn’t be gentle when making macarons – in them must not remain air so it is important to mix vigorously. 6. It is better to weigh all the ingredients in each stage, there is nothing ‘by eye’. Put yur egg whites in a large bowl and mix until they start to squeeze. The mixer shouls trand upright to minimize air entered in the egg whites and mix on low speed. Then add half the sugar and accelerate mixing on medium speed. Mix for about 1 minute and add the rest of the sugar. Turn up to the maximum speed and mix for 2-3 minutes, the marengue must be very firm. At this stage, we are adding color. Instead of color, you can use cocoa powder. Mix until all is blended, it must be quite firm. Mix the ground almonds (blanched - put them in boiling water for 30 seconds, remove and peel off the skin, then dry them well) and powdered sugar and sieve them . Remove the larger pieces that do not pass through a sieve. Then sift again directly in the marengue. Use a silicone spatula and fold the mixture in the marengue - pretty vigurously, from outside to inside, gathering the mixture from the edges. You will need about 45 folds. Everything has to be well united, not bubbly, and the mixture should drop from a spatula and be united with the rest within 10 seconds. Then it is mixed enough (watch the video :). Put the mixture in a confectioneries bag with the broadest extension that you have, or an ordinary freezer bag with an enge cut off - for me it was easier with the extension. Make small 2 cm circles with the mixture - they will flatten and spread, so leave room between each round. Now, this is important: you need to ger rid of the air inside the macarons so you should jam your tin well three times on the kitchen surface on each side. Some bubbles should apper on top of the macarons. Then you should be patient and wait - macarons should be dried for about 30 minutes, until a membrane appears that causes the fingers not to stick to the mixture. 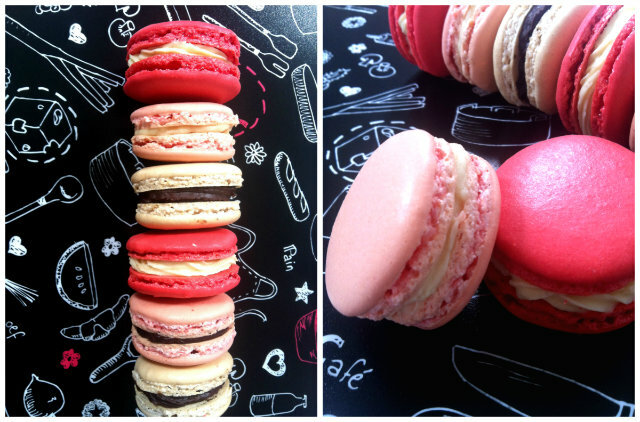 Now preheat the oven to 140 ° C, and when it heats up, bake the macarons. This is the stage where I was crouched in front of the oven and waited for the famous foot to appear :) It appears after 5-7 min ... Bake for 15-20 minutes, after 15 start trying whether the caps are hard on toch and how much they are 'dancing around the foot' - when they're just barely moving, then they are ready. For a ganache you should heat the cream (for white I added cinnamon to the cream) to boiling point, remove from heat and pour over small pieces of chocolate. After one minute you should start mioxing prom the center and mix until all the chocolate has melted. For the black ganache press the orange zest through a little sieve and mix in the cream. Allow to cool for about 30 minutes, mind you, it sqeezes quickly.